Pricing gun labels printed with L Best Before, "L Best Before:"
Tharo Systems, Inc., our American partner is a worldwide leader in the automatic product identification industry since 1982. Tharo has developed Easylabel, the most powerful software for design and label printing, barcode creation. 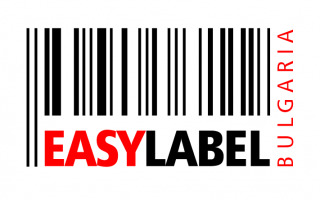 Easylabel is the best-selling software for labels in the world. Easylabel Bulgaria, is established in April 2009 to provide excellent support for the Bulgarian customers. The company is an official partner and thereafter an exclusive representative of the American producer of labels for printers Tharo. Easylabel Bulgaria provides extremely resistant to high loads from the H-series and the small V-series thermal transfer and direct thermal Bar Code Label printers Tharo. These printers have the best price, considering the similar ones that are also offered on the market. Except them, we offer the series Tharo PA 2000 and PA 1200 – printer/applicators and printer accessories. The company is the preferred partner in trade and manufacture of adhesive labels for most surfaces, including paper, corrugated containers, folding cartons, glass, metal, and some plastics. Thermal transfer ribbons for all your labeling requirements. We are in favour for clients who appreciate the propriety and the creative approach in finding the most effective individual decisions for realizing each project. We have proven in front of our customers as a promising and correct partner, answering the specific needs of each of them. We have exceptionally competitive and attractive prices. The quality is superior, world class.